Joie "Aniya" dress in silk satin. For in-store inquiries, use sku #2246184.
cinq sept "Geneva" dress in printed silk. Square neckline; sleeveless. Doubled spaghetti straps cross at back. Empire waist; self-tie drawstring. Concealed side zip. A-line skirt. Ruffled hem. Lining, polyester. Imported. Halpern cocktail dress in sequined wave and scattered houndstooth motif. Shawl collar; V neckline. Sleeveless. Shift silhouette. Mid thigh length. Polyester. Lining, silk. Made in United Kingdom. 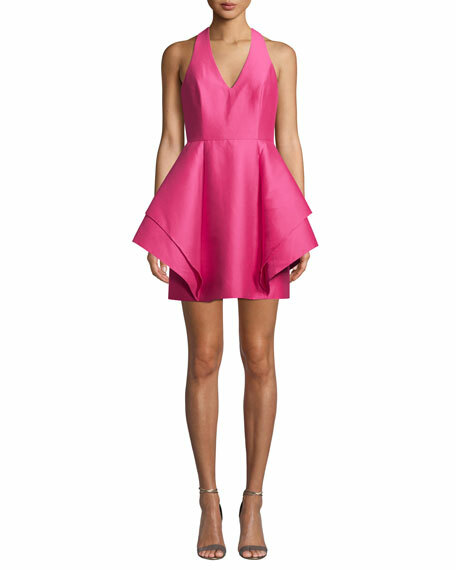 Halston Heritage cocktail dress in structured faille. Approx. 34.5"L down center back. Plunging halter neckline. Ties behind neck. Sleeveless. Dramatic flounce skirt. Back zip. Cotton/silk. Polyester lining. Dry clean. Imported.